A Community Group in Nelson is legally challenging national regulations for pest control, in response to a planned 1080 drop over the Brook Waimarama Sanctuary. The Group is challenging the legality of the Resource Management (Exemption) Regulations 2017, which purport to exempt aerial drops of 1080 and Brodifacoum from usual resource consent requirements. 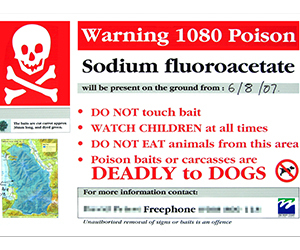 In accordance with the resource consent application process, adjacent landowners had been notified about the planned poison drop on the Brook Waimarama Sanctuary last year, and a hearing was held in April 2016. The sanctuary was granted consent for the operation in May last year, subject to 47 conditions to avoid, remedy or mitigate the effects on the affected parties. However, as a result of changes to the RMA earlier this year, the sanctuary is no longer bound by these conditions. Nelson lawyer Sue Grey, acting on behalf of the Brook Valley Community Group, said the group was challenging the new national regulations for pest control. The Group has asked the Nelson Council to assess the combination of section 13 the RM Act and the freshwater rules in the Nelson Resource Management Plan, which prohibit the deposition of toxic substances in or on or under the bed or bank of a river. Ms Grey notes “the combination of these appear to make the proposed aerial drop of brodifacoum poison baits in, on or under the bed or bank of the Brook Stream (or any other any Nelson river) a prohibited activity”. The Group filed in the High Court in Nelson on Monday and a hearing date is expect to be in July. In the interim period, Brook Sanctuary has temporarily postponed the planned aerial drop of over 24 tonnes of Brodifacoum poison pellets into the sanctuary land and into the headwaters of the Brook Stream at least until the Court can address the issue. Environment Minister Dr Nick Smith has expressed disappointment over the Community Group’s decision to legally challenge national regulations for pest control. He said the national pest control regulations for the use of 1080 and brodifacoum were introduced on the recommendation of the Parliamentary Commissioner for the Environment to ensure consistent and safe use of the poisons. “These national regulations were publicly advertised in April 2016 and received 220 submissions, with 163 in support. The submissions strongly supported the view that the regulation of pest control was best done nationally rather than every council having different rules. The regulations were supported by Royal Forest and Bird Protection Society, Federated Farmers of New Zealand and Local Government New Zealand. I announced the decision to proceed with the new national regulations in February this year”, he said. Minister Smith has described the Brook Valley Community Group’s submission and request as “impractical and unreasonable”. “The Government will be vigorously opposing this legal challenge, including the application for an injunction on current planned pest control operations”, he said.